Djúpivogur has 460 inhabitants, but it seems that almost everyone is involved in art and craft: the town heavily promotes local artists and craft makers. However, the most interesting fact about this town is that recently it was named "Slow Town". So what does it mean? The concept of “slow movement” appeared in 1980s and is getting popular nowadays. Basically this idea encourages people to become calmer and take things slowly. It is not a surprised, that nowadays, especially in big cities life runs too fast, and people constantly feel stress and have a fear to miss something out. Iceland and its small towns is a great reminder that sometimes you need to stop and just to enjoy the moment. Djúpivogur is one of such places with stunning volcanic sand, breathtaking fjords and picturesque mountains. Indeed time almost stops here, so you can connect to nature or enjoy one of numerous craft shops. Nearby you will find Papey Island – it is a small island, which was once inhabited by Irish monks, they were named Papar, that’s why the place was called Papey. Nowadays you will find old wooden church there, as well as watch different species of birds. Another popular sight is Teigarhorn, it is an old farm, that is famous for zeolites. If you want to get a crystal as a souvenir, there is a chance to buy one from the farm owner in Teigarhorn. - to feel the mystique of the pyramid shaped Mt. Bulandstindur. - to examine the unique rocks and lava formations. - to enjoy a delicious local meal. - to check out the Gleðivík Eggs by the artist Sigurður Guðmundsson. - to learn about the unique local building style. - to watch the boats sway in Djúpivogur Harbor. 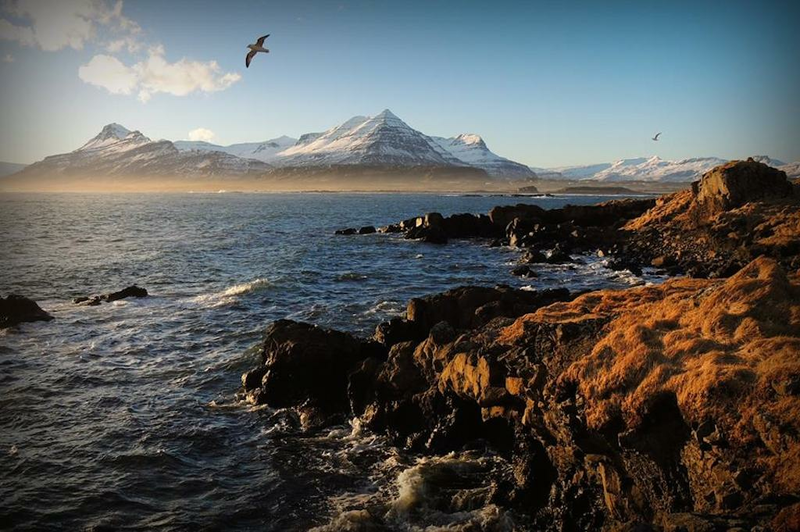 - to experience the rich birdlife of Búlandsnes peninsula. - to look into the local handcraft. So if you are interested in the concept of slow movement or just want to spend a calm day in a beautiful small village, Djúpivogur is a perfect place for you. Just remember, time goes slowly here.